The mountain yellow-legged frog is nearly extinct, and was listed as endangered in 2002. FWS recovery efforts in dollars have met those of other federal agencies, but have never surpassed $250,000. State spending is negligible. Chytrid fungus is an important threat to this species, and contributes to their rapid decline along with other environmental factors, in particular pesticides. Center for Biological Diversity (CBD) filed a notice to sue FWS, in May earlier this year, over the lack of a recovery plan for this critically endangered animal. According to the United States Fish and Wildlife Service (FWS) recovery funding figures, in 2001 over $21 million was spent on the charismatic but relatively secure bald eagle – about 7 times more than was spent for all listed amphibians combined. This majestic bird has since recovered, but hordes of invertebrate, reptile, plant and amphibian species can go for years with little funding from FWS, and receive only limited attention from other federal and state agencies. So, it is unsurprising that their status is not improving. In the last two decades, 168 amphibian species have disappeared from the earth, and another 2,469 species (43% of all amphibians) have declining populations; their rate of extinction could be 211 times the background amphibian extinction rate (McCallum 2007). Chytridiomycosis is one driver of this extinction, along with habitat loss, invasive species and climate change, and may be responsible for the greatest disease-caused loss of biodiversity in recorded history (Skerratt et al. 2007). This impoverishment of global amphibian species should raise the priority of remaining amphibians in conservation efforts here in the U.S., in part because each species we have now represents an element of biodiversity even more unique in nature. Unfortunately, based on data from Recovery Reports to Congress, it appears that amphibians are not being appropriately prioritized. Although overall spending on amphibians has risen from 0.3% of total FWS recovery spending in 1989 to 2.7% in 2009, with 2 times more species listed, funding patterns remain highly inconsistent (graphed below). In particular, 5 species – the California tiger salamander, the Barton Springs salamander, the California red-legged frog, the Arroyo toad, and the Santa Cruz long-toed salamander – monopolize FWS funds. For instance, the Barton Springs salamander of Texas benefited from a $1,800,000 peak in recovery funding in 2004, coincident with SOSA v. EPA, brought against the Environmental Protection Agency (EPA) by CBD and Save Our Springs Alliance (SOSA). The lawsuit’s premise was an alleged EPA violation of the Endangered Species Act due to failure to ensure registered pesticides did not jeopardize the Barton Springs salamander. Figure 2: From 1989 to 2009, $40 million has gone to 5 species, roughly three times more than total spending on 16 of the remaining species, illustrating the irregularity of FWS recovery funding allocation over a 20-year period. FWS funding is not only insufficient for the recovery of already listed species, but also for listing; this process of adding amphibians to the endangered species list is driven by petition and forced to stay on schedule by litigation, diverting precious resources in order to keep the agency on track and escalating species vulnerability. The United States was home to 292 described species of amphibians as of January 22, 2009, but, in the midst of an extinction crisis, only 24 native amphibians are currently listed as threatened or endangered under the Endangered Species Act (ESA), and only 10 species have been added to that list since 1989. Only 17 of these have recovery plans. There are 13 amphibians on the candidate species list, waiting to receive full ESA protections. This past June, the striped newt was denied full protection under the Act; its listing as ‘threatened’ was warranted but precluded, because FWS cannot spend more than appropriated for the Listing Program without violating the Anti-Deficiencies Act and the statutory cap put in place by Congress in FY 1998 (76 Fed. Reg. 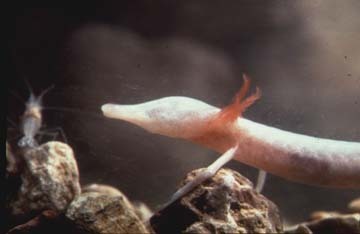 32911); the striped newt is therefore currently listed as a candidate species. Photo courtesy of Texas Parks & Wildlife. The Texas blind salamander (Eurycea rathbuni) has been listed as endangered since 1967; in 2009, it received just over $37,000 for its recovery. In the same year, the California red-legged frog, merely threatened but far more charismatic, received over $1.3 million. In the current paradigm, FWS often prioritizes the recovery of iconic and charismatic species like the bald eagle, and non-flagship species are often guaranteed reasonable funding for recovery only when FWS is driven by lawsuits, or if their habitat coincides with that of a more compelling umbrella species. Since it appears unlikely that funding for recovery and listing activities will increase, the Service needs to make the most of its limited funds and prioritize listings and recovery efforts in an explicit and transparent manner, before the chytrid fungus, habitat destruction, and other threats finish ravaging the entirety of this unique taxon of the tree of life.